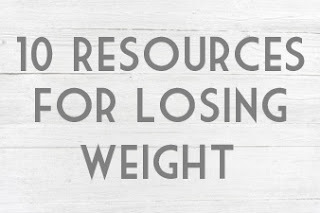 As promised last week, below are some resources I'm using to lose weight this month. 32 oz. Water Bottle - I have a filtered water bottle that holds 32 oz. of water at a time. If I drink 4 of these bottles full of water, I will have drank half of my body weight in ounces of water and, that is my goal for each day! Food Scale - less guesstimating and more knowing exactly how much I'm eating! Aldi - a grocery store with a lot of healthy choices at nearly half of the price. We save anywhere from $25 to $50 each time we shop at Aldi. The expense of buying healthy food is no longer an excuse! Accountability Partners - between my husband and a friend of mine, we have been keeping each other accountable each day. Sparkpeople - some people use MyFitnessPal but, I've been a Sparkpeople girl for over 10 years now. This is the app I use to track my nutrition each day. Diet Bet - this is my motivation to stay on track this month! I've got a diet bet to win! Meal Prepping - this is also crucial. I can buy as many heads of lettuce I want but, if it's not chopped up and stored away in a container, I am much less likely to actually eat it. I use Sundays for most of my meal prepping! Sleep - I am trying to get better about going to bed before midnight. Sleep is so important! 8 Focus Words - focus words to help keep me... focused! You can find my list, here: 2018 Focus Words. It's good for me to review this list today because, truth be told, I had a super off-track weekend. On Friday, we went out to dinner with some friends we haven't seen in a while; on Saturday night we went out to dinner with Nick's mom and stepdad, and; last night we ordered in stuffed pizza, subs and breadsticks to share. Holy moley did we go off track this weekend! Thank God for a fresh week! I am putting my off-track weekend behind me and starting this Monday off with a full 32 oz. of water before anything else. Every day is a new start. Let's make this one count!